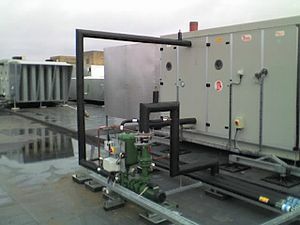 Consider Alpha Energy Solutions for your HVAC equipment rentals. Working with our experienced technicians is a great way to ease the headaches involved with selecting rented equipment for your facility or projects. The selection of HVAC equipment available for commercial and industrial settings online is vast, but not every supplier can offer helpful benefits from delivery to installation. HVAC equipment rentals are excellent for short-term projects, work sites and events. In fact, there are many applications in which rental units may be necessary including emergency shelters and for hazardous responses. Rental systems can deliver required performance for less of the commitment however, drilling down into the exact specifics may demand the assistance of an expert with time spent in the field. Our technicians at Alpha Energy Solutions have over 2000 years of field experience, combined. We work with a range of equipment including HVAC equipment rentals from all of the major manufacturer brands. You can feel confident knowing that your investment in a unit or multiple units will be backed by warranties, quality and service. Before embarking on your search for HVAC Equipment rentals, consider your application, term of use, placement and of course your budget. Depending on where your unit or units will be placed, you may need to check with local officials regarding any necessary permits that may be required prior to installation. Your equipment selection does not end with installation. Technicians at Alpha Energy Solutions can handle your service requests 24-7; technicians are on-call. Moreover, we are capable of responding to your repair needs without delay especially if parts are needed. We have a large network of distributors that we work with to obtain any parts that you may need for your HVAC units. Maintaining your equipment is necessary even if it is a rental. We offer Preventative Maintenance Programs which also may be used to reduce the likelihood of performance issues due to wear. Contact us to inquire about a maintenance plan that is suited for your equipment setup.